You may have heard of the benefits of a low-carb diet, but what about a slow-carb diet? Not all carbs are created equal. Some metabolize quickly, leaving you tired and hungry; others take their time, helping you feel full and energetic for longer. How can you tell what carbs are slow-carbs, though? That’s where the glycemic index (GI) comes in. But what is the glycemic index anyway? Simply put, the glycemic index ranks carbohydrates on a scale of 1 to 100 based on how much they release glucose into your bloodstream, raising your blood sugar. The higher the number, the quicker your body turns those carbs into glucose, and the quicker your blood sugar will rise and fall. The lower the number, the slower the process, which means your blood sugar levels will fluctuate less. The glycemic index was originally designed to help diabetics manage their blood sugar levels, but it has since become more widely recognized as having benefits for all. Managing your blood sugar levels can actually help reduce your risk of getting type 2 diabetes, as well as help you maintain weight loss and support heart health. What does the GI number mean? Some foods have a naturally low GI number--like beans, vegetables, fruits, and even pasta--while others are notoriously high--like white bread, rice, and potatoes. Here’s how to spot the most common high-GI foods and what low-GI items to enjoy in their place. Bagels, English muffins, and soft white breads--any bread product made primarily with bleached white flour is likely to have a high GI number. Swap these out for low-GI alternatives like nutrient-dense whole grain, multigrain, or pumpernickel breads, especially those made with oats, seeds, and nuts. Look for breads that list “whole grain” as the first ingredient, which is a good indication of a lower glycemic choice. Likewise, avoid loafs that contain “refined” grains--this means most of the nutrients that would’ve kept the GI number low were stripped out in the refining process! The best option here? Leave out breads and pastas entirely, and try some swaps like zucchini noodles or sweet potato toasts. While instant oats might make for a super convenient breakfast, that ease comes with the cost of a high-GI number. For a slow-carb alternative, you’re better off preparing steel cut or traditional rolled oats the slow way: stovetop. 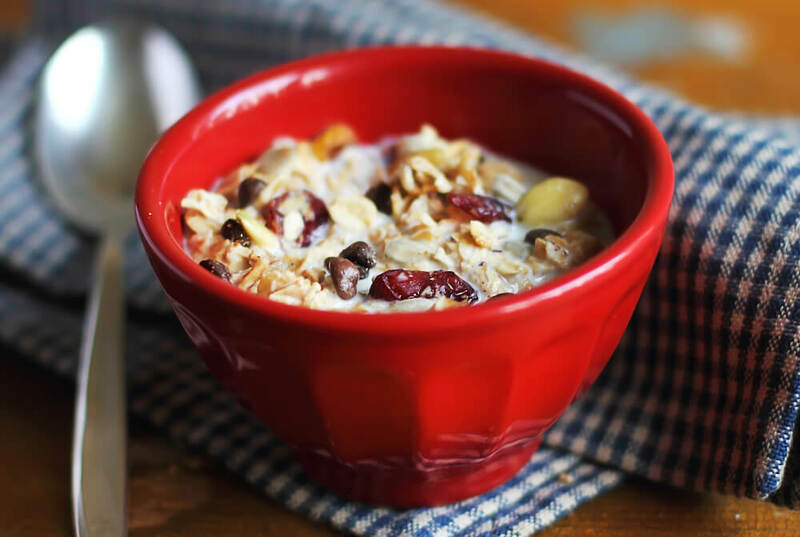 When choosing a low-GI breakfast food, you should skip over most of the cereal aisle with its tempting puffed rice, shredded wheat, and flaked corn options. Instead, go for a natural muesli, which is made from rolled oats and nuts, and usually contains less sugar. Not all rice is created equally. Swap out jasmine or short-medium grain white rice for one of several lower-GI options: red, black, basmati, or wild rice. For an even healthier swap, substitute cauliflower rice or a different grain like barley, quinoa, buckwheat, or bulgar. Yukon or russet, these classic white potatoes have a high GI number in whatever form they take. Try mashed sweet potato as a side instead, or get the satisfying crunch of a potato chip from baked chickpeas. Pretzels, popcorn, saltines, and rice cakes all have high GI numbers. If you want something healthier to snack on, try whole grain or seed crackers instead. Better yet, skip the crackers entirely and reach for trail mix of dried fruit and nuts or dip slices of cucumber, celery, or broccoli in hummus.